It all began slowly on Sunday Evening. We noticed that the water in our toilet bowl was higher than normal and was taking some time to drop to normal levels. Then Dad came in and asked if we had noticed the issue as he had the same problem. We checked the other two toilets and we knew we "had a problem". Next morning, Lana did a marathon ring around to find a plumber that could visit us and clean out the septic pipe. Lana called about four and talked to answering machines. Then one answered his own phone and Lana exclaimed, "Wow! A real person!" "Now, don't get excited yet." was the reply. All the plumbers had long lists and couldn't get to us before Christmas. We had eleven people who couldn't hold on quite that long! Eventually one lady answered the phone and said, "Hang on, I'll just get him." and Lana grabbed Dad in excitement saying, "He is there! We have hope!" The plumber arrived mid afternoon and went to work with his "electric eel" which went down the pipe and found the blockage. 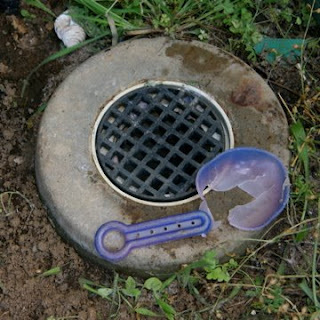 The plastic spade (pictured) was the culprit. It had been dropped in by "someone" into the access hatch (also pictured), and wedged in the pipe. Our relocator strikes again! $280 later and it was all over. "Now you're back in business." said the plumber as he left. "In more ways than one." replied Lana. But this was only part one! Unbeknown to us, the release of the blockage caused a wave of muck to rush into the first septic tank. This then surged into the cleansing tank and blocked the exit pipe which is designed to pump out excess water - not muck. The first we knew of this problem was on Wednesday after lunch when the warning light and alarm on the septic started. "Opa," Eric informed Dad, ominously, "The warning light is on." We opened the tank and started a new call around. We needed a pump out of all the muck from both septic tanks on the day before Christmas. And all the muck disposal venues were closed for Christmas. Lana eventually got to a local fellow and mentioned we have eleven people here. He explained that he couldn't get it done until after Christmas. Lana then played the "sympathy card", talking about the number of bottoms using the system. He sighed and said, "Everybody should have a toilet - and a telephone." Lana paused in hope and he continued with a sigh, "Give me your address. Give me half an hour to go down the shop and buy my wife a card and a couple of bottles of red and I'll be out there." He arrived and cleaned out the tanks, with Dad helping and working together with him. Meanwhile, Dad pulled out the pump and cleaned out the muck from there. Eventually all was OK and we were once more back in business. He was supposed to charge us $560, but he only charged us $500. 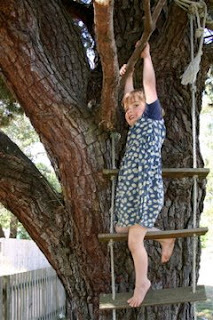 The children have been enjoying our large tree, climbing and swinging on many limbs. I noticed Rose hanging on a branch with her feet about 6 feet off the ground. "What are you doing?" I asked as I moved in to assist. "This!" she replied happily swinging on the branch. So I just stayed close to catch her if she fell, but she reached across to the ladder and got down quite safely. In our State there is quite a procedure for a person to gain a driver's license. 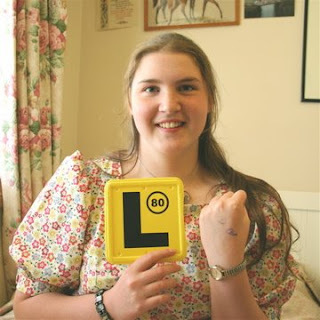 First they pass a written test to obtain a learner's permit. They then have a minimum of one year and up to three years to gain 120 hours of driving experience, covering a number of key learning areas including at least 20 hours of night driving. That is a lot of driving! Ariel passed her written test first go. She knew that if she failed she would have to try again and pay another fee but I don't think she needed the financial threat as she remembers what she reads very well. We then decided to use a professional trainer for 20 hours to make sure she learned the basics in a structured manner. Now the remaining time she is mostly spending with me. For all you Dads out there, think of this as a great bonding experience. Together you face danger and stress, calmly suggesting improvements to your daughter's driving like, "Slow down ... slow down, SLOW DOWN! STOP!!!". "I was stopping!" comes the calm reply, as you get your hand off the hand/emergency brake, and breathe again. Ah, this is what memories are made of. But that was early days. Every time we go out, Ariel is my chauffeur, driving at up to the maximum 80km per hour (50 mph). The trip may take a little longer for highway trips, but it all counts gradually to those magical 120 hours. Ariel is improving greatly. So much so that she earned her first Elephant Stamp on her hand. Ariel likes to have her hair "just so" and Lana has been assisting her for many years. On Saturday Ariel decided that twin platts joined together would be the correct style for the day. I only had a small improvement. 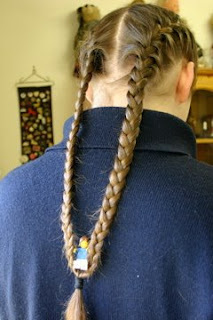 A little Lego lady could sit quite comfortably in the join, swinging delicately while holding on to some strands of hair. Lana's Dad ("Opa") was working in the workshop/garage and Martin was doing his usual thing - tagging along and providing valuable assistance. While Opa was busy and being noisy, Martin found the ear protectors and put them on. Of course, he began talking louder because he couldn't hear himself properly. 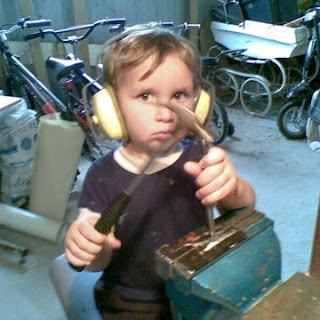 Then Martin found a hammer and centre punch and started copying how he had seen Opa work with the tools. Noticing the potential danger, Opa thought quickly, pulled out his phone and took a photo. The next playground stage is "The Fort". This has the main building and then a bridge to a tower. Attached to the tower is an old swing set friends had which was partly broken - now fixed and back in action. Underneath the tower will be a sandpit and some netting to climb upon. This playground is getting bigger all the time. Speed of growth depends on funding and sourcing of second hand materials. As you can see from the second photo, the bridge and most of the top level are finally complete. See how all the children are gathered along the bridge? 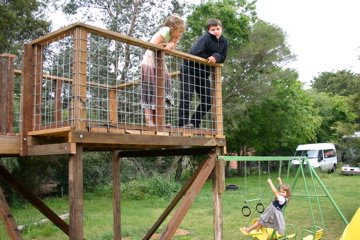 The construction is strong enough to handle adults as well as plenty of children, running, jumping and otherwise playing around. Funding and materials are currently in slow down mode again, but the next steps include a roof over the fort, linked to a water tank to collect rain water. 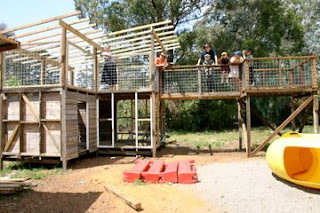 This way the children have their own water to play with without using our reserves. Like many areas outside main towns in Australia, our water supply is entirely supplied by rain water. We are all used to using water wisely and every roof around here is attached somehow to a water tank. In line with our financial training for the children, the older boys Eric (15) and James(12.5) wanted some more funds for the things they wanted. This meant finding a way of earning money from people other than Dad and Mum. One of the local village residents only comes down every couple of weeks and found the maintenance portion very draining to their enjoyment of village life. So they pay the boys a fixed amount per month to keep the grounds maintained - mowing, leaf clearing, gutter cleaning and so on. This is apportioned to us as a contribution to capital costs (lawn mower, trimmer and so on) and then each of the boys splitting across their savings and spending accounts. This then led to getting more mowing work for a couple more residents on an ad hoc basis. 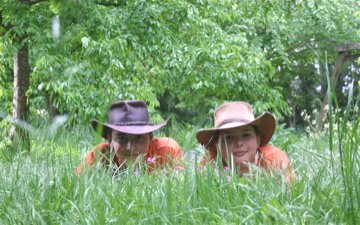 This photo is the one we use for their business cards for their business: Bruggie Brothers Garden Maintenance. This has led to another milestone. When the children earn a consistent $10 or more per month they can open up a bank account. This is pretty exciting for them as they see interest received as a bonus money. "So the bank pays me not to spend my money?" James asked in amazement the other day. "Yes," I replied, "Ariel earned a week's wages last quarter for leaving the money in her account." Although the children earn their own money and at least 1/3rd goes into savings, we retain veto rights over their purchases. This has allowed them to learn what is - and more importantly, what is not - appropriate spending. The other condition to having their own bank account is maintaining their own set of accounts in Quicken. That way we can do reports and see all the money they earned and where it all went. Reviewing their accounts involve me asking questions like, "Look how much you spent on these items over the last year. How much do you still play with them? Do you still have them?" This is a great training tool. I was very interested when James came up to me the other day and asked, "Can you change my savings/spend mix? I want to save half rather than a third." Woohoo! Tick off that little check box marked "Learn basic financial responsibility". Matt Harding is a funny guy. He has been able to turn a funny idea of dancing a jig in front of a video camera for family and friends into a business! He details his travels at his website: Where the Hell is Matt? and the Sydney Morning Herald has an interesting story on him too. In these days of media telling us the world is ending, Matt is a good example of how opportunities are everywhere to enjoy life and make a living too. I just felt here is a good example of the one man's love of life spreading worldwide. Matt's site tells his story here.